On page SEO is a very important element of your SEO strategy and it’s definitely something you should learn to understand. Luckily it doesn’t have to be so hard, because with our own webtexttool you’ll be able to write a pretty good optimized SEO-text. But anyway, in this guide you’ll get a summary of the most important elements of on page SEO and will help you to succeed in on-page SEO. Want to know more about SEO in general? Read our article about the benefits of SEO! The first and most important element of on page SEO is of course; your content. If you’re content isn’t interesting to read, you probably won’t get many views and a high search engine ranking. That’s why it’s very important to write ‘VUUSP-content’. The ‘V’ stands for valuable, because your content should always have valuable information for your target audience. The first ‘U’ stands for unique, you should make sure that your content is unique, has something new to say and doesn’t duplicate articles that you or other people have written before. The second ‘U’ stands for up-to-date, because you have to make sure that everything you write is up-to-date, don’t give incorrect information because your sources are outdated. The ‘S’ stands for shareable, all of your content should be shareable, because this makes it easier to spread your content all over the internet. The ‘P’ stands for professional, every one of your articles should be written professional and with care, you shouldn’t publish something that you don’t fully support! If you’ve ticked off all of these conditions, your content is written good enough to share with the world! 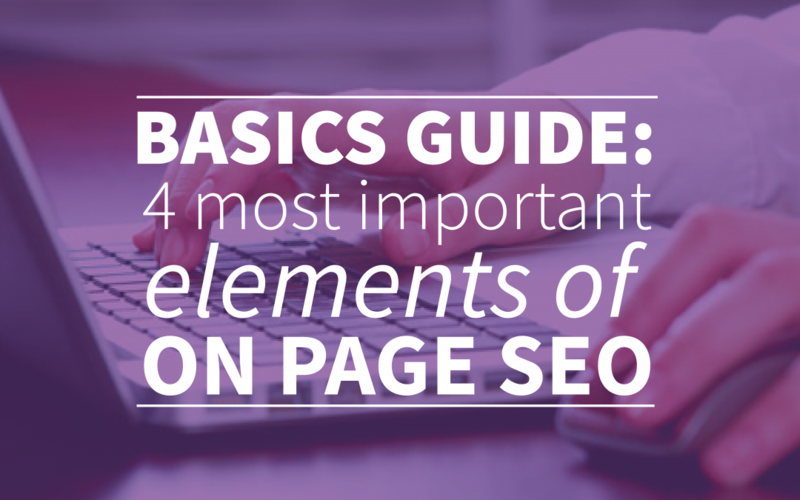 The next element of on page SEO are your ‘Page title’ and ‘Meta description’. This together is the representative of your webpage in Google. These elements are the final step for people before they visit your website, so the most important function of these elements is to activate the searchers to click on your link. The searchers will see your website the way you can see it in the picture above, so that’s all you have to present yourself. No pictures, no fancy typography, just a few characters to convince the searchers to visit your website. If you want to know more about how you should write a powerful meta description, you should read our previous article about this subject! While placing the keyword in all the right places, you’re also structuring your content at the same time. This is also an important element of SEO, because structure makes your content easier to read and scannable. Actually, scannable should be one of the letters in the VUUSP-content conditions too. It’s very important that you’re able to know what an article is about in just a few seconds, while looking at the text. Last but not least, your webpage design should be clear and the usability should be as good as it can be. Also for mobile phones, tablets and other devices, it’s important that you can access all of the content and images. This has a big influence on your on page SEO and it’s definetly something you shouldn’t forget in this mobile world. Also it’s important that your pages link back and forward to a category, sub-category (if possible) and homepage. This way you connect your webpages to eachother which makes you website more accessable. You could compare it with a book, the book is your website and the pages are the chapters. If a reader reads one chapter, he or she should be able to get back to other chapters and go forward too. This way he or she is more likely to read more of the book and in this case your website! If you follow this guide with a little bit of help from webtexttool, you’ll be able to do your on page seo in no-time! Take a look at our free trial account to get started right away. Good luck!